President Trump on Thursday hosted wounded warriors at the White House for an event kicking off the annual Soldier Ride, a multi-day bicycle ride aimed at empowering veterans recovering from the wounds of war. 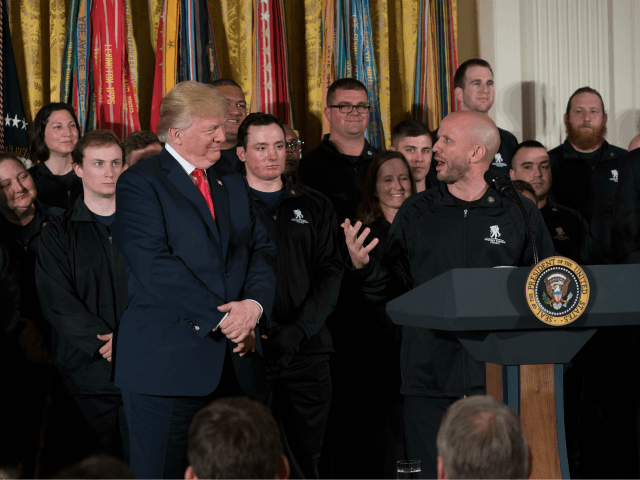 Fifty-six wounded warriors joined Trump onstage in the East Room to commemorate the event, with an audience of their family members, administration members, members of Congress, and members of major veteran service organizations. “The heroes in this room today come from every background and every single walk of life. But they are united by the sacred bonds of duty and loyalty that hold us together as one nation, under God. Your devotion, your endurance, and your unbreakable will are all a great inspiration to every single American,” he said. “Each of you has endured life-changing injuries. Each of you has conquered adversity with resolve — never giving in, never giving up, and never ever backing down. Have you ever given in, anybody here? I don’t think so,” he said, gesturing to the veterans behind him and prompting laughter. Trump also recognized their family members, asking them to stand. Trump did not address the tumult over leadership of the VA, but talked about his efforts to improve the department. Trump noted that his administration last year signed the VA Accountability and Whistleblower Protection Act of 2017 into law, and is now working on a new version of the Veterans Choice program, which makes it easier for veterans to seek care from private doctors. “We’re going to have the finest choice program that you’ve ever seen. In fact, we turned down one program because we truly didn’t think it was good enough. Is that right? We could have gotten it passed, and I said, ‘Nope, not good enough. We’re going to go for the real deal,'” he said. The president also noted that the administration also received the highest defense budget in history — $700 billion for 2018 and $716 billion for 2019. “Our military will be stronger, more powerful than at any time ever before. 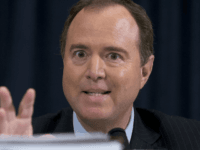 Better equipment — we make the greatest equipment in the world,” he said. Trump thanked Army Lt. Gen. (Ret.) Mike Linnington, CEO of Wounded Warrior Project, and also introduced a wounded warrior he met years ago while hosting a fundraising golf tournament at one of his properties, Dan Nevins. Nevins was serving as the infantry squad leader of Task Force Tacoma in Iraq in 2004 when his vehicle was struck by a roadside bomb. He lost both legs below the knee, but through surgeries and physical therapy, has become a motivational speaker and works to help other veterans and their families. “It was an honor to be on the tee box with you then. And it’s even a greater honor to share the stage with you now as you graciously host Wounded Warrior Project Soldier Ride and these amazing warriors who’ve served the cause of freedom with distinction,” Nevins said. Nevins also credited the Wounded Warrior Project with helping him recover. “These are the ones that helped me learn that disability didn’t define me, but that I get to define what the rest of my life was going to be like. And they helped me learn that anything is possible when I put in the work,” he said.